ProShop ERP, QMS, MES| IL, IN, IA, KY WI| ShopWare Inc.
ProShop is a complete manufacturing management software including ERP, MES, QMS and Tool Management. It’s 100% web-based (hosted at your facility or in the cloud) and 100% paperless. It’s software…but it’s also manufacturing best practices. Contact Us Today to Learn how ProShop can make your shop more profitable. Not ready yet? Learn more about the comprehensive features of ProShop below. Quick video on how a shop employee would select a job to work on, log into a specific operation, do some in-process inspection and update a work order quantity. Say goodbye to travelers and whiteboards to plan your employee’s workday. 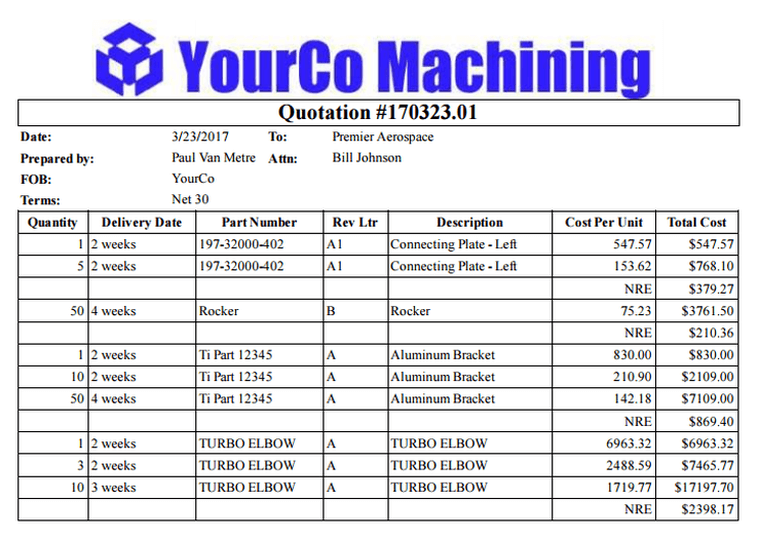 Streamline tasks and quality control bottlenecks with a quick, easy to use interface to get parts out the door faster. A brief 4 minute video about how ProShop integrates cutting tool management for your CNC machine shop, from tool crib and programming, through to loading into your CNC machines with offline presets. Completely integrated with purchasing, job costing and forecasting. ProShop integrates with Mastercam Tool libraries. All customers, vendors, and other types of contacts are managed here quickly and easily all within the same interface. Dynamically link to projects and items related to those contacts. Rich Olson, Production Manager tells us a little about how ProShop helped them keep track of production and meet customer deadlines on time, every time. ProShop instantly gave Stealth Aero Marine the ability to be smarter and meet deadlines faster. With a 300% Return on Investment in the first year they were blown away at the power and quality of ProShop. Brian Anderson, Resources Development Manager tells us about how traceability was very challenging before ProShop using Excel and a handful of other databases, none of which did exactly what they wanted to accomplish. Then they found ProShop. ProShop gave Trulife an interactive live view of what’s going on on the shop floor and allowed the scheduler to make on-demand changes to improve shop productivity. A comprehensive Shop Management software needs depth. Explore the various ERP – MES – QMS modules below. Create Estimates faster than you ever have before. 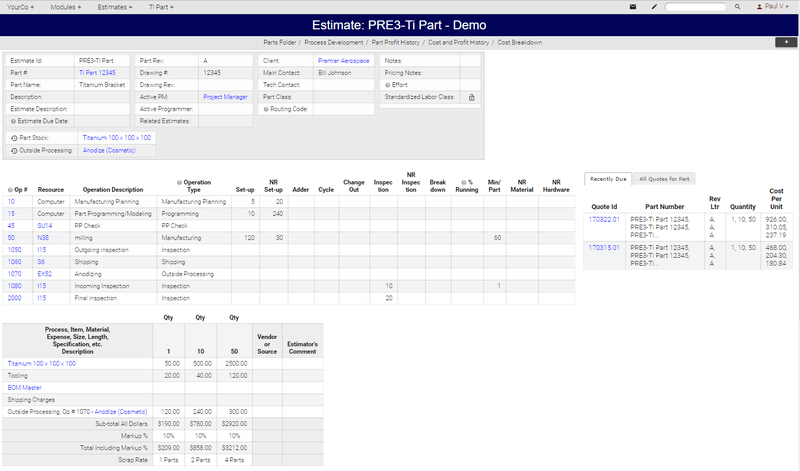 You can create estimates from scratch or use our robust Rapid Estimator Template system. Include all factors in your business while creating your estimate from labor time, set-up and cycle time, out-of plant processes and more. With a click convert your estimate to a quote to send to a customer. Quote non-recurring costs or divide the NRE into the unit price of each of the quantities. When a client submits an order based on a quote, with a single click that quote may be turned into a Customer Purchase Order. Turn that quotation into a Customer PO with one click. 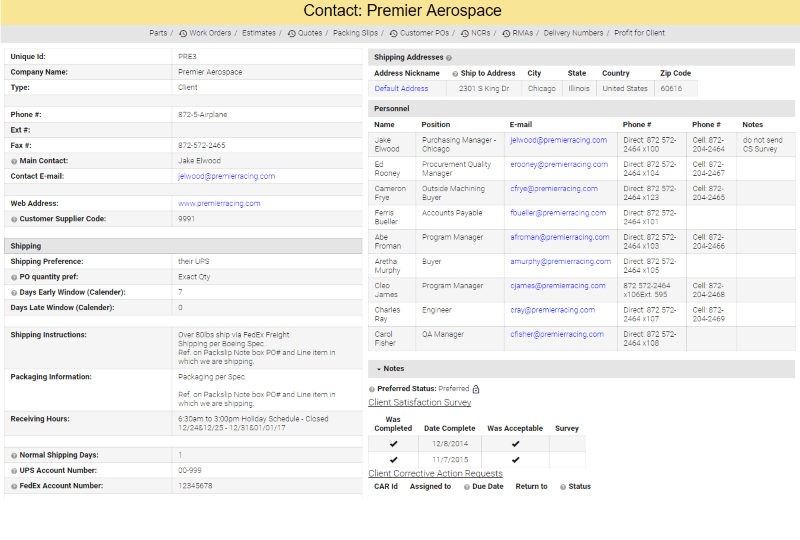 Customer Contact page feeds delivery locations, credit terms, primary contact, shipping and quality requirements, etc. automatically. Fully ISO-9000 and AS9100 compliant contract review functionality without ever printing a single piece of paper. 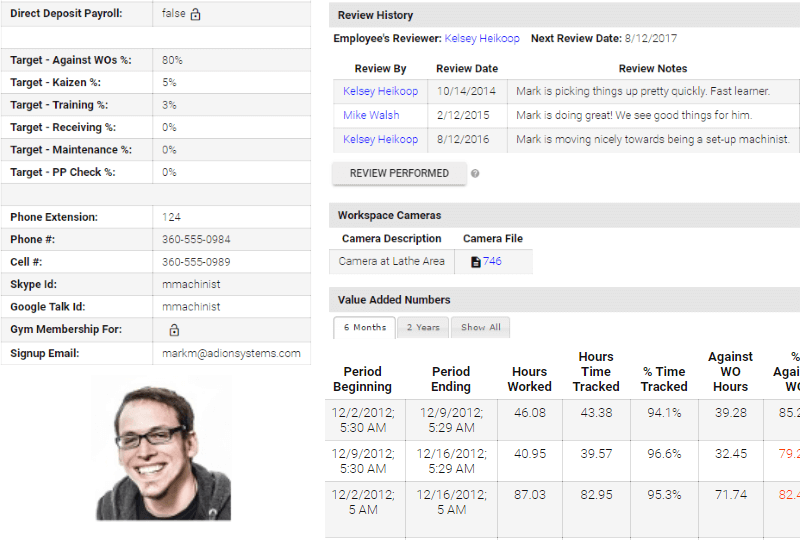 This module keeps track of data for anyone you communicate with outside the company. All customer quality requirements, shipping addresses, credit terms, receiving hours, workmanship standards, cosmetic requirements or any other documents referenced by the company. This page also offers quick links to that customer’s Work Orders, Purchase Orders, historic profit numbers, on-time delivery, customer satisfaction survey results, and more. The Parts module is where all part specific work instructions, quality templates, and shop routings are kept. Eliminate tribal knowledge with visual work instructions including text, photos, and videos. 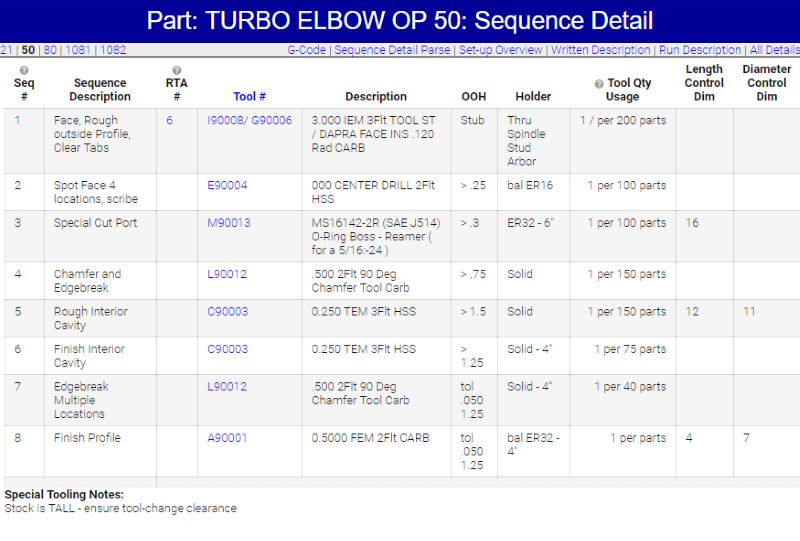 See a list of all the currently active, in-process and completed Work Orders for any part number. 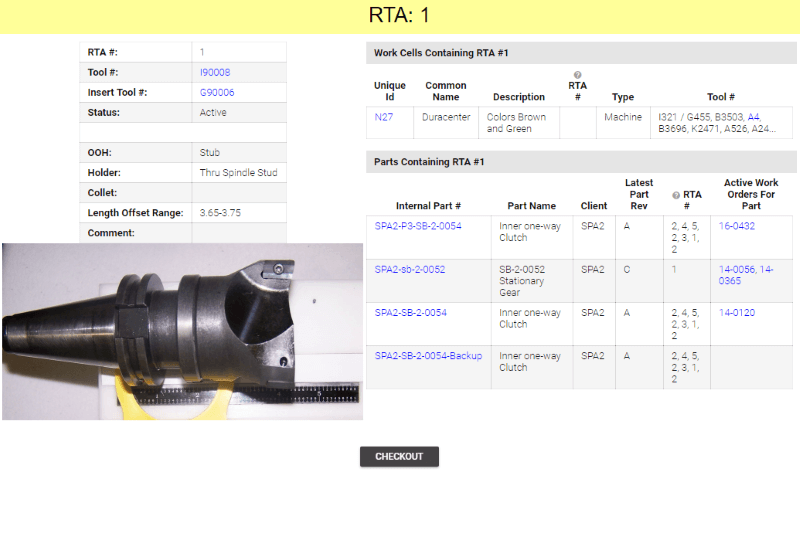 CAM users can embed simulation videos into work instructions and link directly to set-up sheets from their CAM system. Reducing machine set-up time has never been easier. 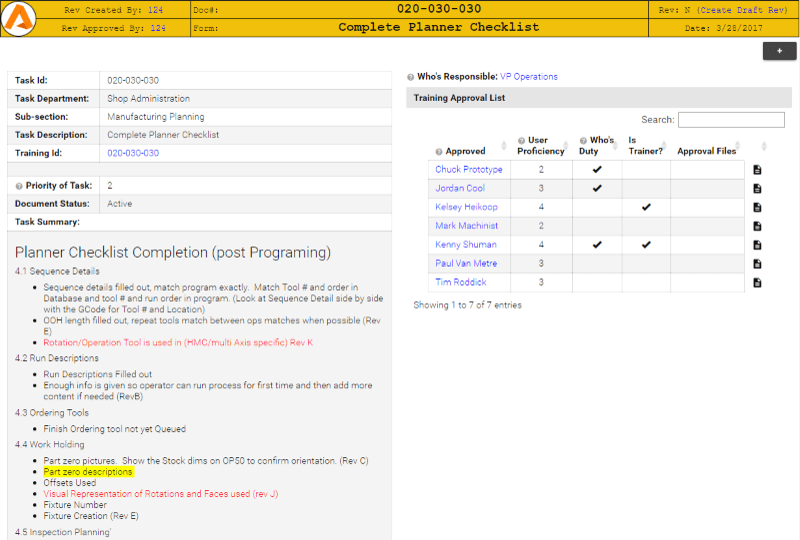 Work Orders (WO) offer complete documentation of all current and past jobs.Find real time status of all the jobs in your shop and information such as how many labor hours of time have been tracked, dollars spent out-of-pocket, how many parts are finished through what stage, where out-of-plant parts are at and when they will be back. 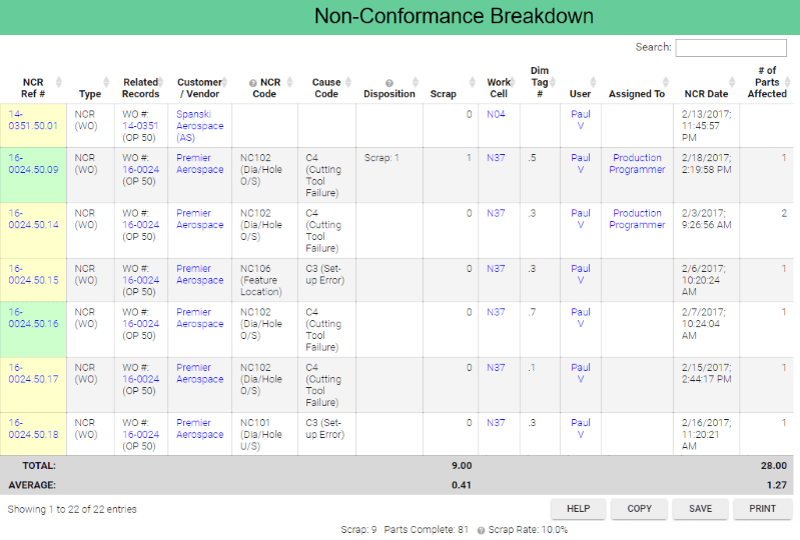 Track every component in a multi-level BOM, including all raw material and outside processing. At Final Inspection, a single mouse click of the upper level assembly will collate and bring forward every related cert, and audit the FAI results, for preparing into the complete document package saving hours of time every day. 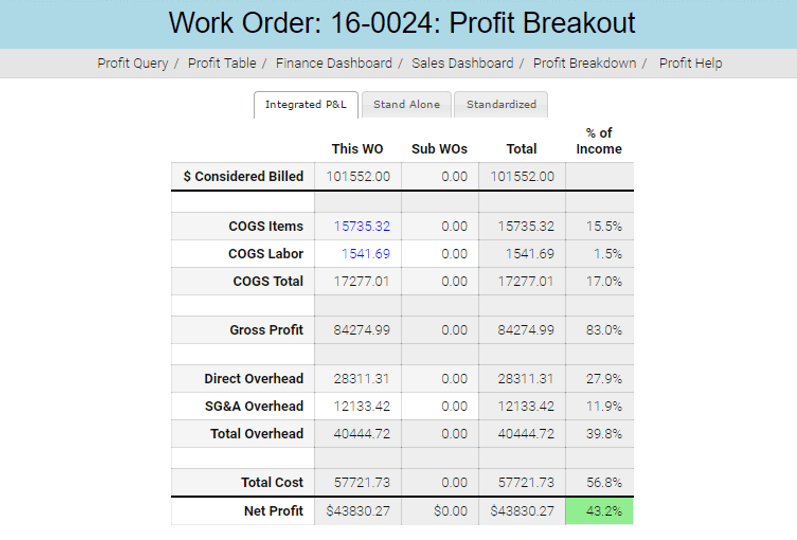 ProShop has powerful Job Costing functionality built-in. 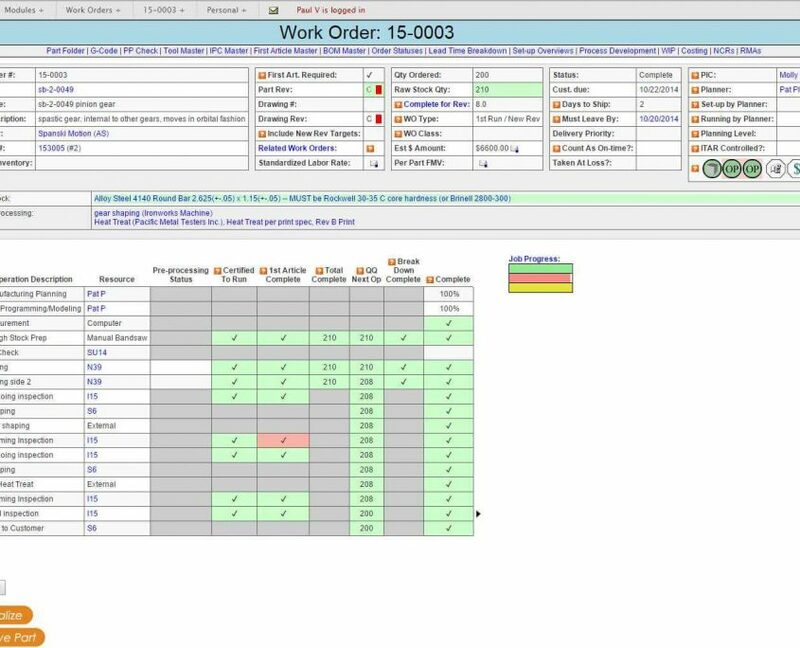 As soon as any dollars are spent on a Work Order, or any time tracking is recorded, ProShop will start to tell you how much cost has been incurred and how much progress you’ve made against the production targets. Make corrective action if a job isn’t going well and understand where you can make process improvement on your operations. Knowing the status of your jobs and if you will be on time is hard! To do it well, you need to have up-to-the-minute status of jobs currently on the machines and if you have everything needed for jobs about to hit the machine. ProShop scheduling is a finite capacity system, showing you in real-time, the exact number of hours left on all jobs and when they will finish based on your shift schedule. Shift resources and re-route jobs easily and find out how changes affect delivery times. 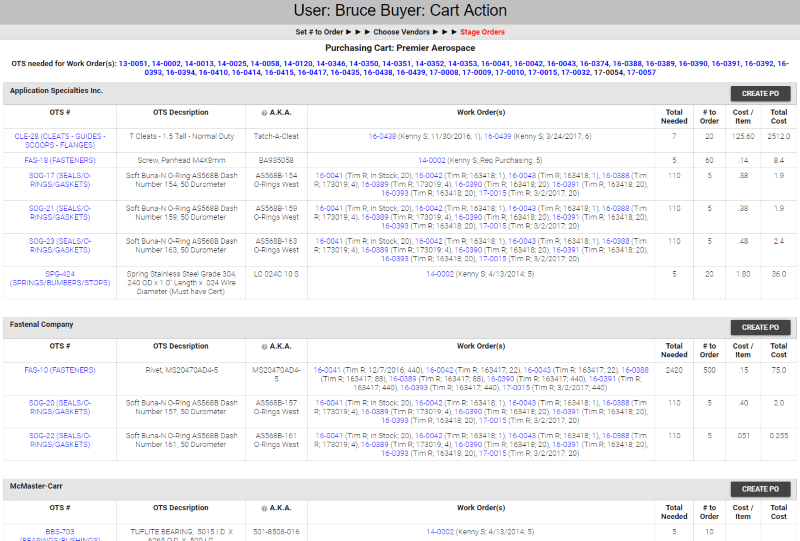 Issue POs to your vendors directly from the Purchasing Dashboard which displays live purchasing requirements from planning for all active Work Orders based on need date and commodity type. See all outstanding POs, late orders, and time sensitive orders. All certs for purchased items are scanned and attached to each line item, setting the stage for easy retrieval of certs. Robust inventory management is built into the Parts and Components off the Shelf (COTS) modules. 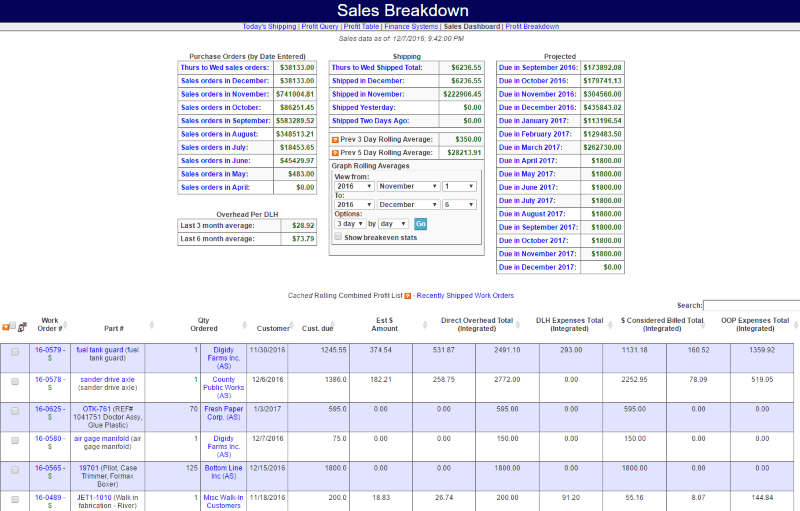 See at a glance how much inventory you have in your company, the value and where it is located. 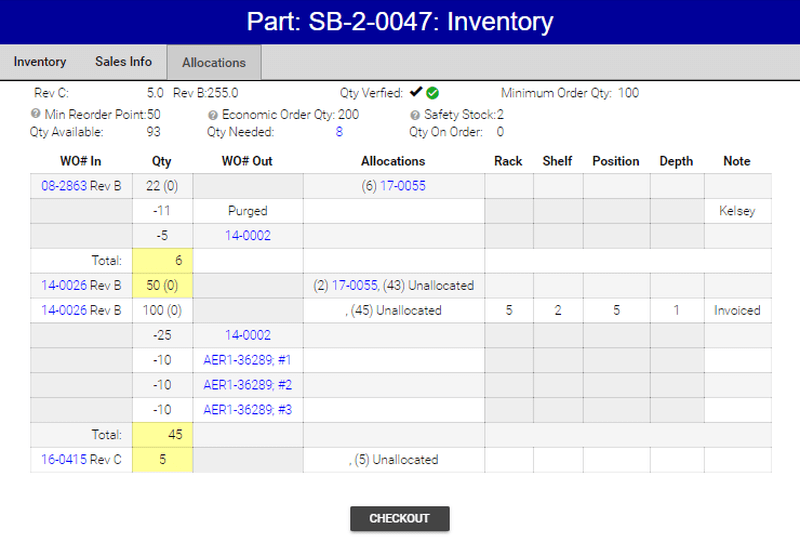 From any part number or assembly, you can see exactly which Work Order it was created on. The equipment module is a fully functional Maintenance Management System, where all company assets, equipment and inspection tools are managed including calibration requirements for precision instruments. 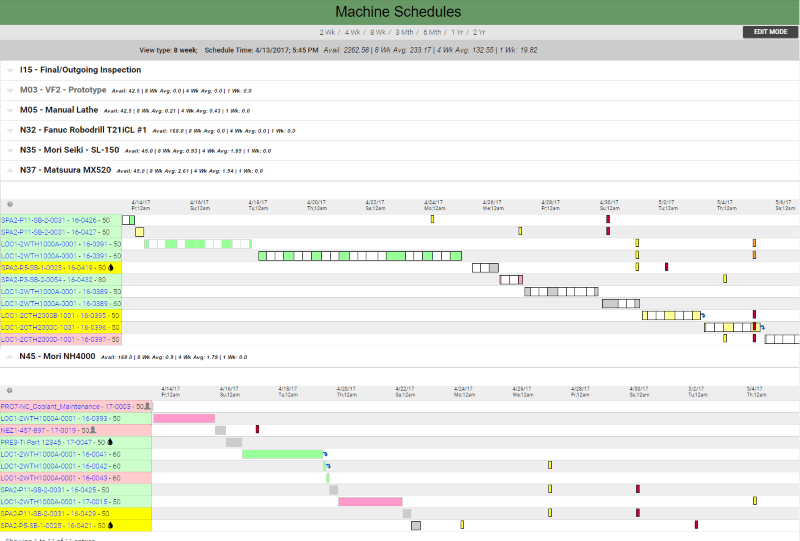 Schedule and assign resources to maintain machines with work instructions including videos, photos, etc. Alert purchasing automatically of any items that need to be routinely ordered. 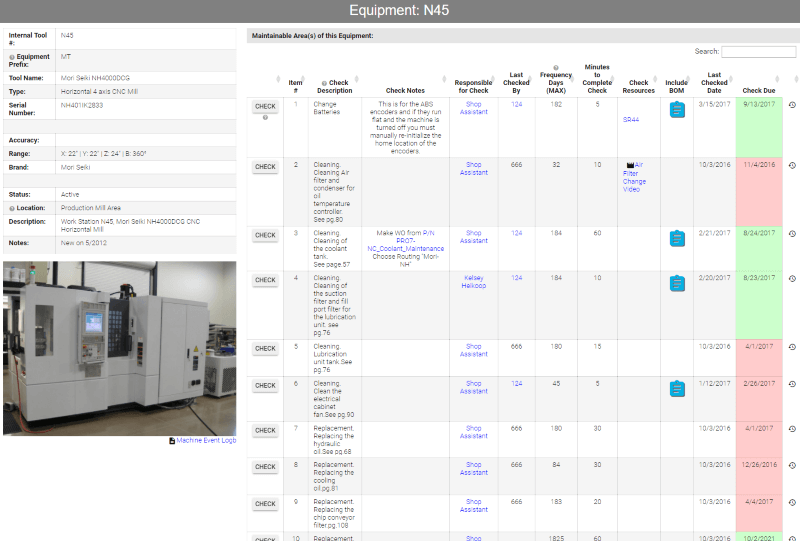 The Tooling module is where all consumable tooling is managed and tracked. Any important attribute can be recorded, searched, etc. See any tool that is currently in use in a Workcell (machine tool or tool caddy) and what is forecast to be needed from any current Work Orders. 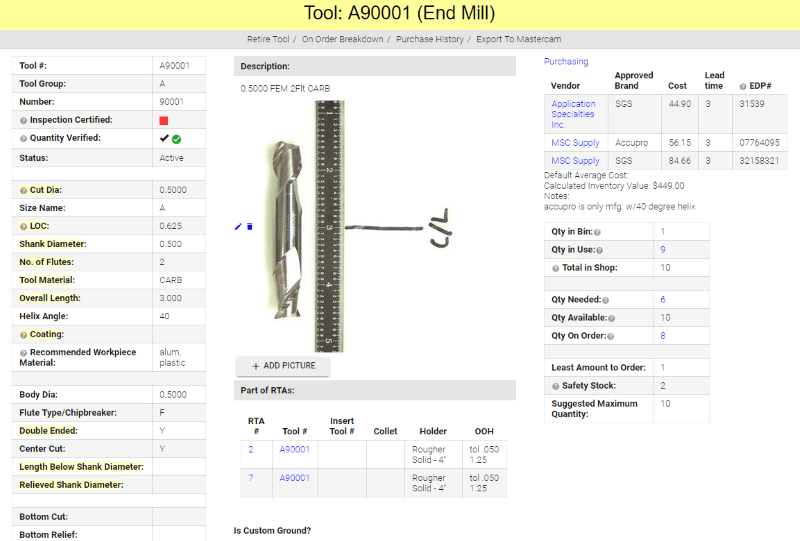 For shops using Mastercam, tool information can also be exported into Mastercam individually or for an entire job. Tool lists can then be used to set-up a caddy or CNC machine offline and will accept tool length and diameter data directly from your presetter and then will generate the appropriate offset file to upload into your machine. 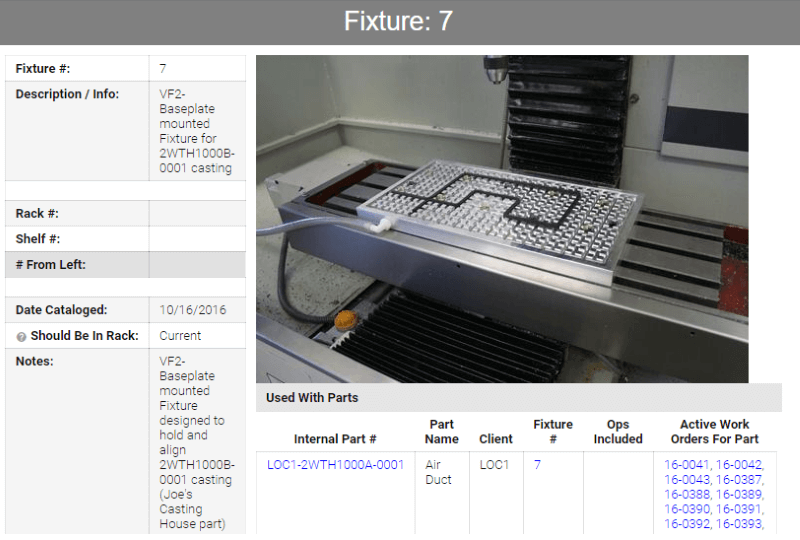 The Fixtures module allows management of all fixtures for custom work holding, vises, chucks and more. By using the Equipment module alongside the Fixture module, complete maintenance of fixtures can be managed with scheduled maintenance and replacement schedules, ensuring your fixtures are always ready. 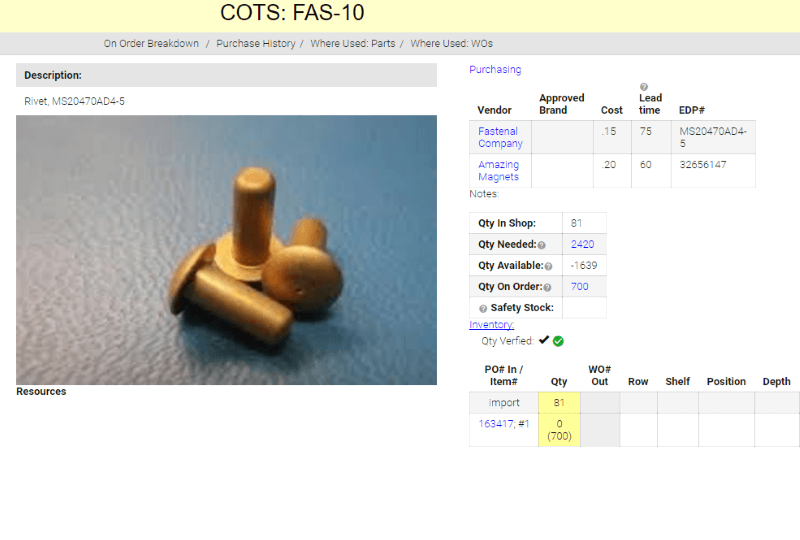 COTS stands for Components Off The Shelf. It is where all non-custom items such as fasteners, fluids, materials, consumables and hardware are handled. COTS items can be added to any BOM (Bill of Materials) on the Part and Work Order modules. COTS may have multiple approved vendors with pricing, lead times, etc. Full traceability for all COTS items is handled without any extra work by purchasing or manufacturing staff, allowing for certifications to automatically flow into document packages when jobs are shipped. RTA stands for Rotating Tool Assembly. This module is specifically for companies who perform machining and manages a combination of tool holder, collet, cutting tool, inserts, and out-of-holder length. 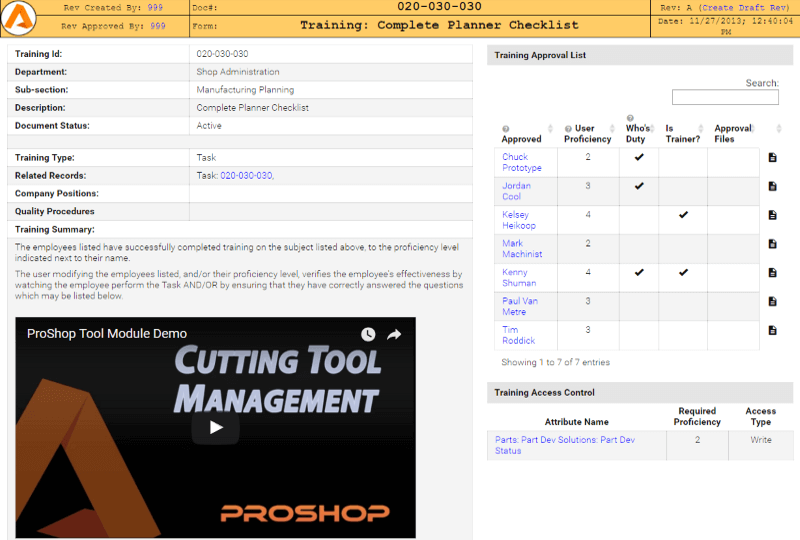 Standardize and manage common tool assembly configuration in ProShop to get the most consistent performance from your tools and machines. Alert users if an RTA is measured to be out of tolerance on offline presetters. Work cells are the items that are used for the schedule. 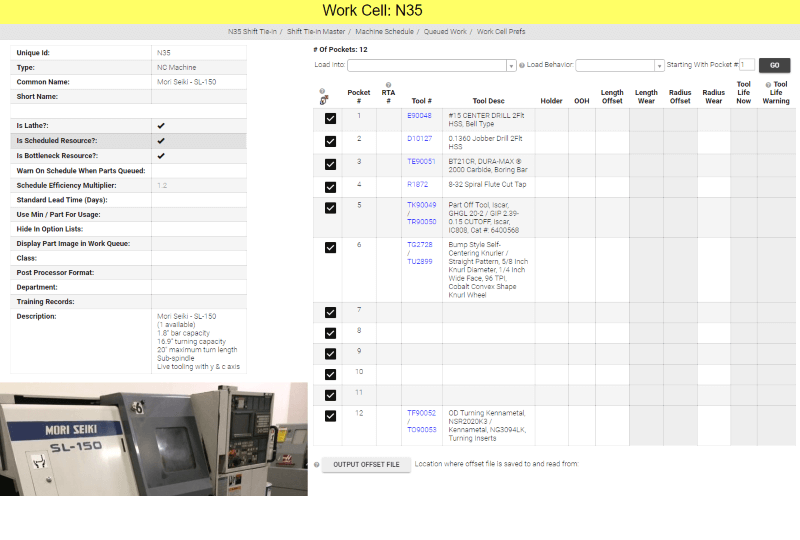 Any machine tool, workbench, equipment, or even person can be assigned as a work cell. Once assigned as a work cell, the number and timing of available hours per day can be managed using the schedule to allow unlimited work shift schedules. All employees who use ProShop are assigned as a User. The User page gives HR and management a place to record important information about employees including employment information, benefit summary, contact information and more. Access levels to ProShop modules, fields and information is tightly controlled for all users so very finite control is available to allow employees just the right amount of access to data. ProShop has a built-in time clock for punching in and out of work. Clock in or out quickly from any device using a password. See current and historic clock punches for any time frame. 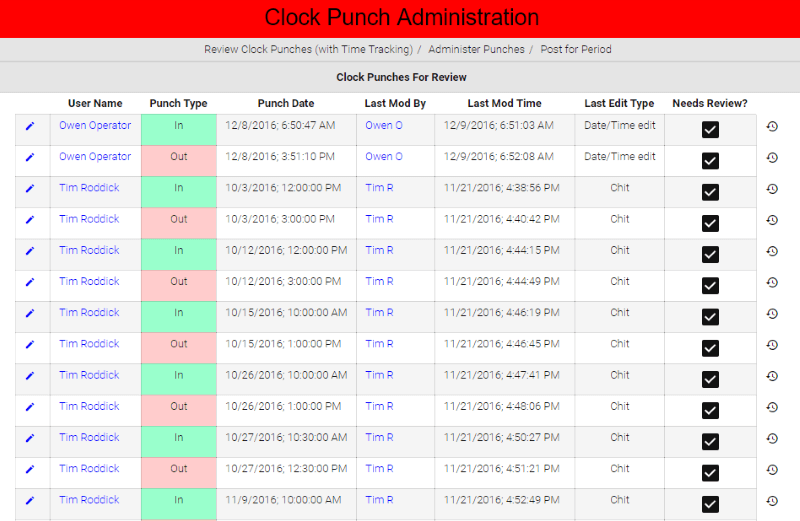 A system for missed punches allows managers to review and approve when an employee forgets to punch at the correct time. Managers are also alerted to any anomalies. Export data into accounting packages such as QuickBooks, Sage, or 3rd party processors for payroll. It is essential for time tracking to be accurate, specific and fast to record. The Time Tracking module was designed to take a few seconds to interface with and allows employees to record which Work Orders they are working on (if any), what type of work they are doing such as set-up, running, programming, troubleshooting, how many parts have been made and more. All time tracking data feeds into the job costing system so actual direct labor costs are automatically generated in real-time. The Messaging system is critical for intra-company communications. 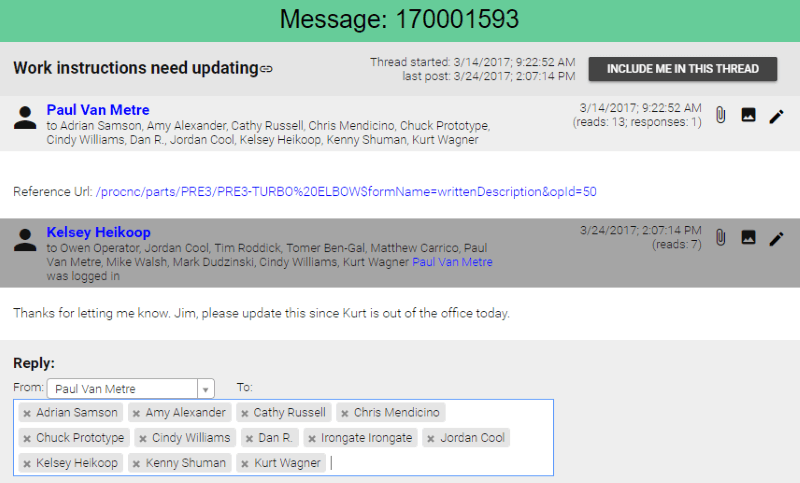 It is used as a replacement for email for many companies.Thread based system allows conversations between any groups of users with direct links to the applicable page in ProShop. Issue automated messages, alerting users and managers of myriad important alerts such as when NCRs are created, when Time Tracking is over target by a determined percentage, when Equipment is nearing its calibration or maintenance due dates, when documents are ready for review and approvals, and many more. All communications will be permanently recorded, making research on past communication much more simple. An unlimited number of company positions can be created and assigned to Users. These can then be assigned as responsible for actions and categories across ProShop including NCRs, Audits, Quality Procedures, Equipment, and more. Reassign work temporarily and permanently when user changes happen. Reveal those that have complete and incomplete training for the positions they are in. 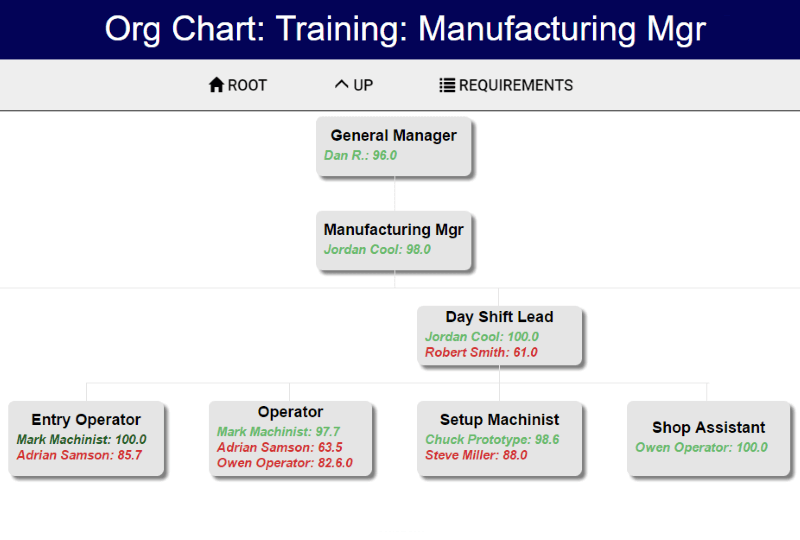 Assign training paths for users to advance to higher positions in the company. Clearly see how far along employees are towards any new Company Position. Dashboards are a critical tool to monitor the performance of the company and individual departments at all levels of the company. With over 25 unique Dashboards for customer service, planning, shipping, inspection, receiving, sales, finance, and much more, every department and manager are continuously being updated in real time by all users who are working within ProShop. Users can see the pulse of the entire company and what needs action next. Dashboards can also be modified for specific needs for each client. 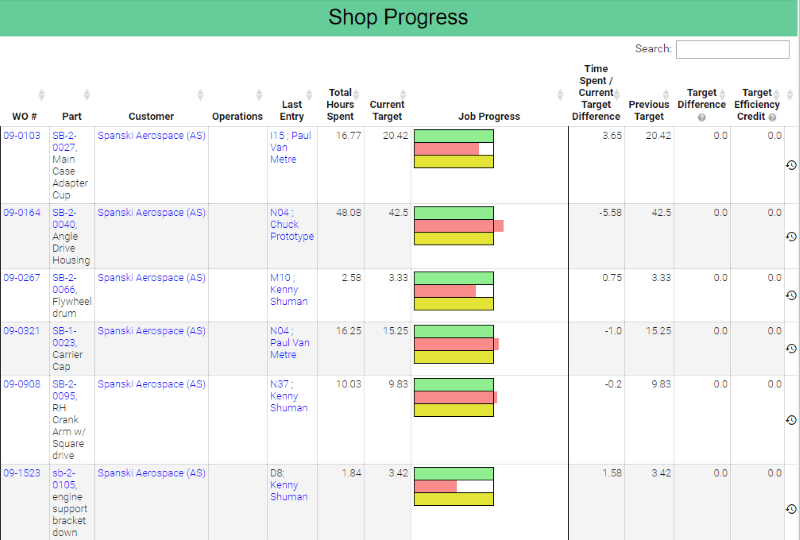 ProShop has powerful reporting tools to take all the data within ProShop and make it meaningful. See live automatically generated reports and dashboards. Take immediate action based on key insights. Third party reporting software is unnecessary, reducing cost and complexity. 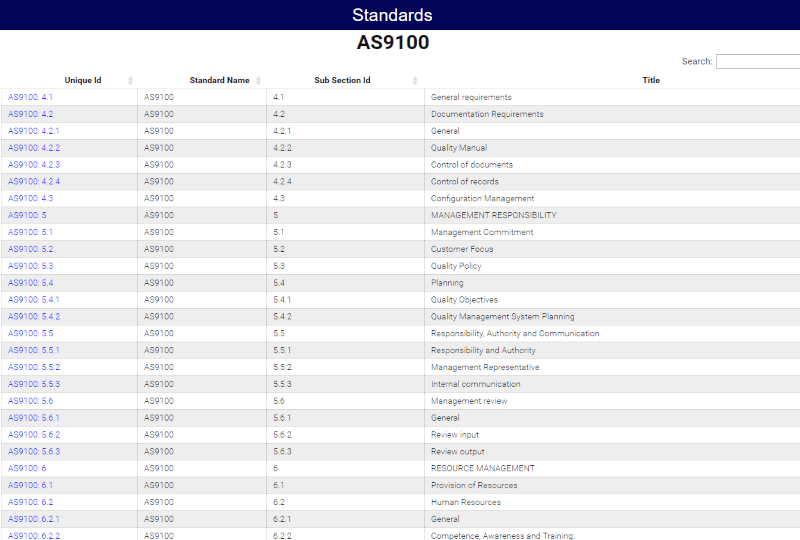 The Standards module is where all the requirements of the quality system are stored. Configurable for ISO-9001, AS9100, ISO-13485, American Petroleum Institute (API), ISO-14001 or any others. 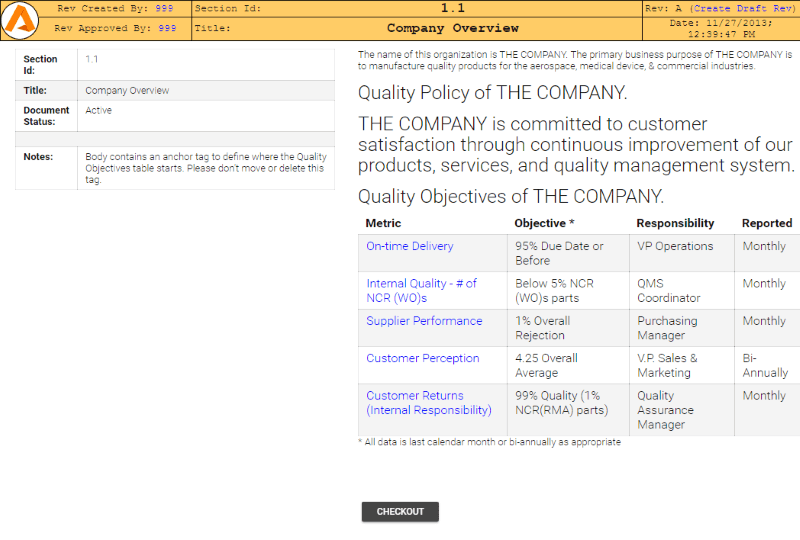 Easily see what sections of any standard are being met by your QMS content. Accomplish external audits in half the time. The Quality Manual is a broad document that sets forth the quality system procedures and defines compliance with the standards your company is certified for. Generate new sections with complete revision control. Alert management to sign off on any new revisions to the manual. Export a PDF version of the quality manual labeled as an “Uncontrolled Copy” with the date and time of printing. Quality Procedures or QPs are detailed documents that cover specific areas of the company and how the systems and procedures are managed to ensure that high quality and efficiency is maintained. Never before has a QMS been so deeply yet simply integrated into an ERP system, allowing the QMS to truly be used as a tool for continuous improvement in a very lightweight and low cost way. The Task module is an extremely robust yet lightweight way to document and rev. control all of the important tasks, processes and work instructions in your company. Create with a full text editor – including rich text, checklists, videos, photos, PDFs, etc. 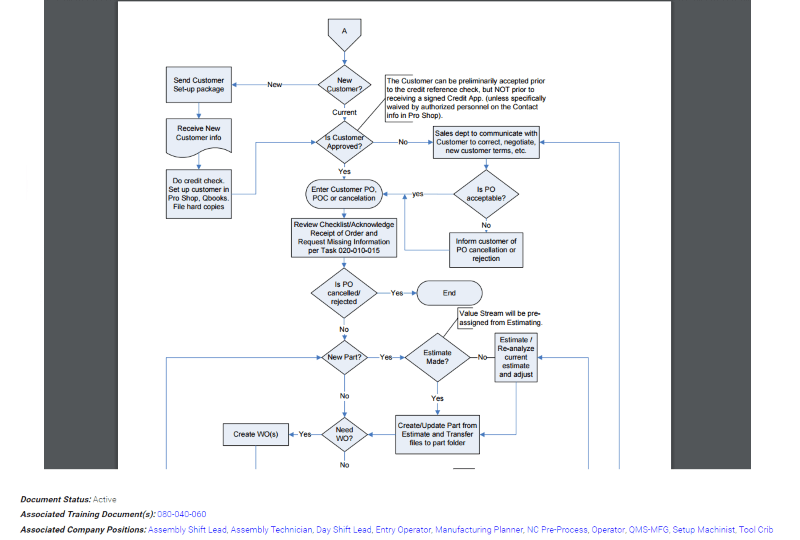 This simple workflow process allows the organization to make revisions quickly and easily, enabling the Task module to be actively used to improve company processes and developing a culture of continuous improvement. The Training module offers training for any Task, Quality Procedure, or stand-alone activity. Trainings include instructions on how to accomplish any activity, and may include tests, videos, photos, etc. When a User completes a training, they are signed off on a new higher proficiency level by the designated trainer. Training lists are included for every Company Position so employees can clearly see what training they need to accomplish in order to be qualified for promotions to new Company Positions. 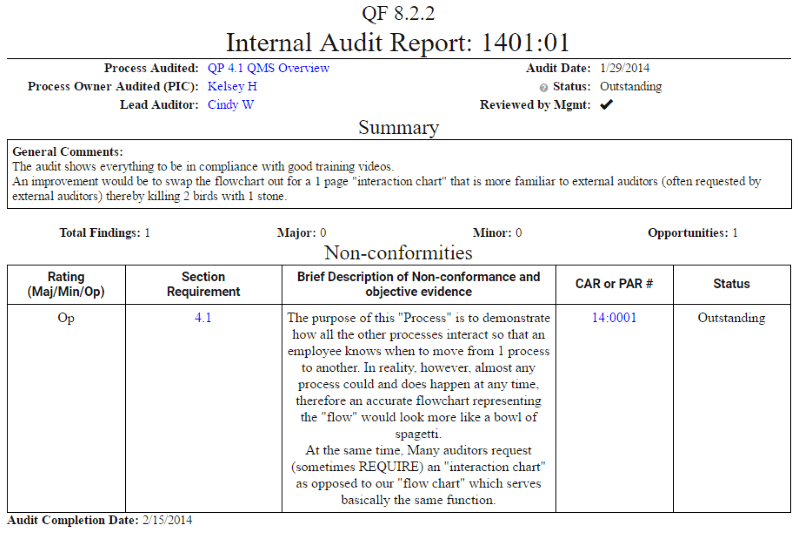 Training matrices are also available to review company-wide training proficiency levels, filtered and sorted by shift. Training gaps can also be seen on the Org Chart under Company Positions. Similar to Tasks, when revisions are made for a Training record, only the trained users will receive Message alerts to review the new revision of the Training. The training module makes it much easier to ensure that all the elements of your QMS will be followed properly. The training module is also great for any type of training you may want to create from shop best practices, shop math and more. It enables companies to rapidly develop their employees skills to better serve the company and customers. Corrective Action Requests (CAR) may be issued for any reason including from RMAs, Audits, NCRs, Management Reviews and Customer Satisfaction Surveys. They may be internal, or issued to 3rd party such as a vendor. They include full 5C workflow for closed loop management of root causes. 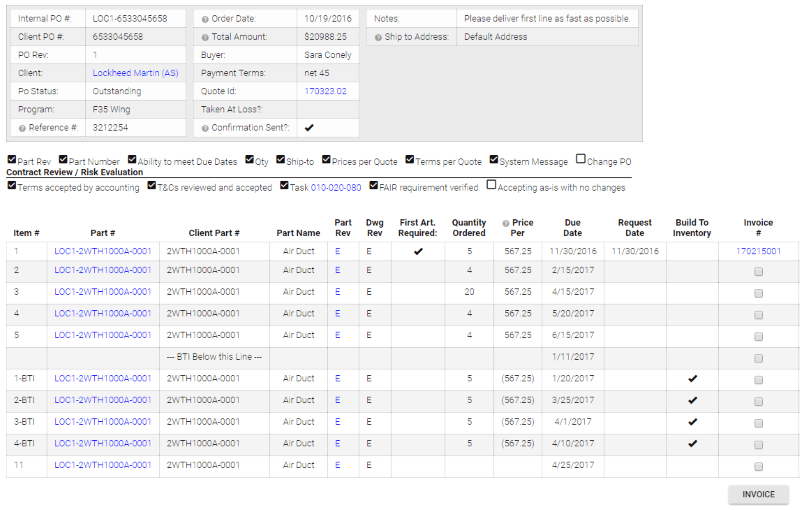 The CAR module ties in and links directly to any applicable other modules such as Work Orders, Purchase Orders and NCRs. CARs can be queried for detailed reporting of virtually any attribute and exported for offline reporting as needed. CARs automatic workflow sends automatic notifications in the Messaging system to employees. The CAR action dates will also be listed in the employee’s Document Queue which is visible to any manager. CAR’s issued from a client will be permanently linked from the Contact module for that client for quick and easy reference. With tight integration into the ERP and MES modules, CARs can be a very effective and low cost way to initiate positive change in your organization. 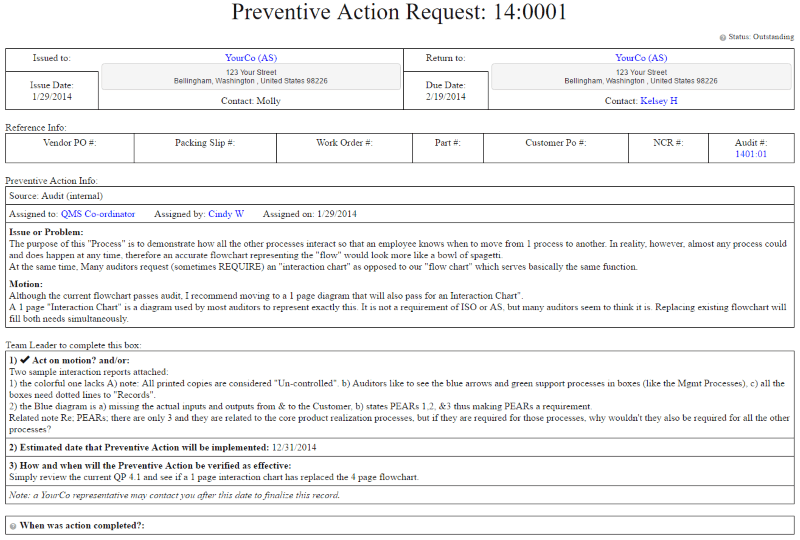 Preventative Action Requests (PAR) behave just like Corrective actions. The PAR module ties in and links directly to any applicable other modules such as Work Orders, Purchase Orders and NCRs. PARs can be queried for detailed reporting of virtually any attribute and exported for offline reporting as needed. Automatic workflow built in, sending automatic notifications in the Messaging system to employee. The PAR action dates will also be listed in the employee’s Document Queue which is visible to any manager. With tight integration into the ERP and MES modules, PARs can be a very effective and low cost way to initiate positive change in your organization. The Audit module tracks the process of issuing audits, tracking the results of and follow up of audit findings. Initiated from either internal or external audits. 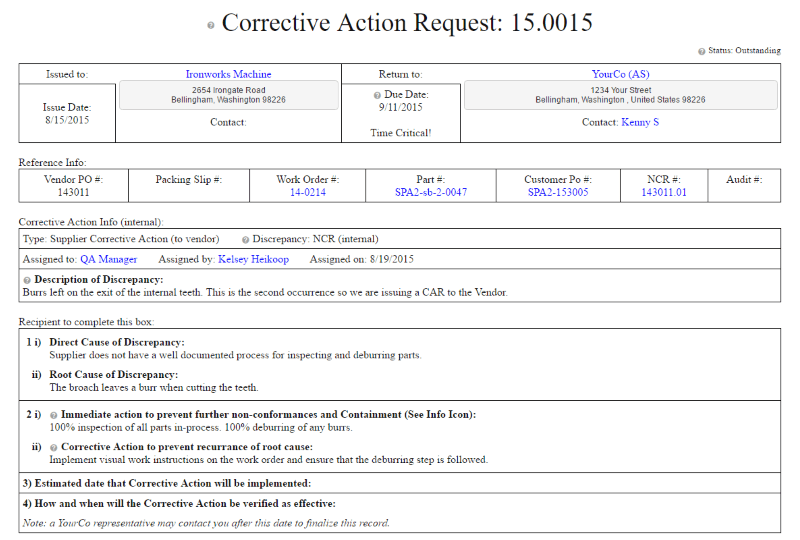 Corrective Action Requests (CAR) and Preventative Action Requests (PAR) can be issued directly from the Audit module based on the severity of findings. Any Quality Procedures or Tasks being audited are linked directly to the Audit Report for reference, making it easy to find all related information and evidence of findings. The NCR module tracks and manages any kind of quality non-conformance and ties it back to the ERP system. NCRs can be one of three types: Internal (Work Order), External (Vendor PO), or Customer (RMA). NCR will be completely filled out with all the related and linked modules for reporting and searching. All pertinent information is carried over. All data is easily exported without third party software for further use if needed. The NCR dashboard very powerful and extremely easy to use for tracking and reporting on NCRs based on any possible criteria such as employees, customers, workcells, work shifts, vendor, part numbers, cause code, NCR code, scrap rate, and much more. 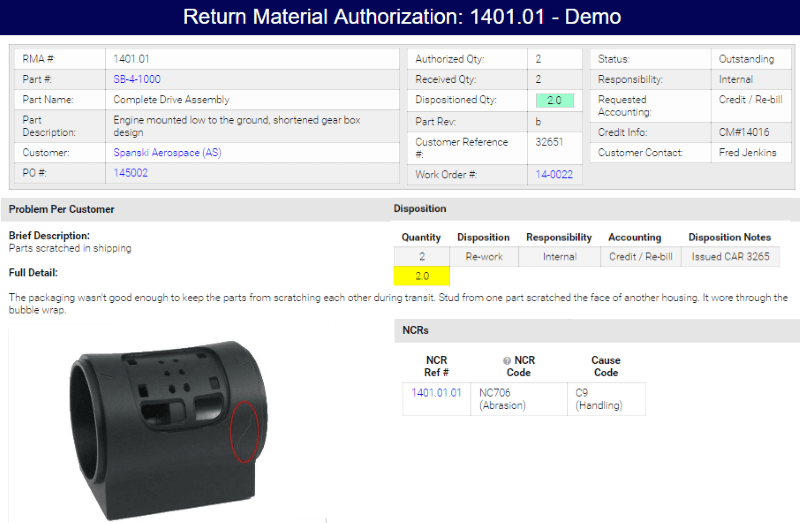 Return Material Authorizations (RMA) enable a way to track all incoming product returned or rejected by a Customer. Links to create RMAs are strategically placed on pages where such an action might be initiated to make the process quick and easy. Only approved staff are able to issue RMAs. Responsibility, cost and accounting instructions can be specified. Direct links to any applicable items so the full picture of a potential quality issue can be analyzed with just a few mouse clicks. Any kind of files including photos can be attached or embedded into the RMA. RMAs from a given client are automatically listed on their Contact page and maintained permanently. Made it this far? You should probably give us a call.